Cassel comes from a family of curse workers—people who have the power to change your emotions, your memories, your luck, by the slightest touch of their hands. And since curse work is illegal, they’re all criminals. Many become mobsters and con artists. But not Cassel. He hasn’t got magic, so he’s an outsider, the straight kid in a crooked family. You just have to ignore one small detail—he killed his best friend, Lila, three years ago. Cassel has carefully built up a façade of normalcy, blending into the crowd. But his façade starts to crumble when he finds himself sleepwalking, propelled into the night by terrifying dreams about a white cat that wants to tell him something. He’s noticing other disturbing things too, including the strange behavior of his two brothers. They are keeping secrets from him. As Cassel begins to suspect he’s part of a huge con game, he must unravel his past and his memories. To find out the truth, Cassel will have to outcon the conmen. White Cat, the first book in the Curse Workers took me a little to get into but once I did, I found it an addictive story. Cassel is part of a Curse Worker family; each with a different ability to affect a person with one touch. His mother can affect emotions, and his brother Philip can manipulate a person’s body, and Barron can influence a person’s luck. All of them have abilities except for him. He’s always felt left out and a little less for not being one of them. The one thing that sets Cassel apart is the fact that he killed his best friend and first love, Lila, three years ago and he doesn’t know why. I felt bad for Cassel as the story begins. He tries to wipe out his memory by being a normal high school student but fails miserably. The story takes off as Cassel’s memories start to unravel, and he starts digging into the secrets of the past. His family has been less than truthful about events, using and abusing him. As I discovered what his mother and brothers did to him I was ticked for Cassel! His mother is a complete piece of work, although her manipulations were without malice at least; can’t say the same about the brothers, in my opinion. Everything came together and played out brilliantly in the end, and I loved Cassel’s cleverness. That ending! Let’s just say I wanted to choke Cassel’s mother! I listened to the audio version of this and I thought Jesse Eisenberg’s voice fit Cassel’s character well. Curses and Cons. Magic and the Mob. Cassel always thought he was an ordinary guy, until he realized his memories were being manipulated by his brothers. Now he knows the truth—he’s the most powerful curse worker around. A touch of his hand can transform anything—or anyone—into something else. That was how Lila, the girl he loved, became a white cat. Cassel was tricked into thinking he killed her, when actually he tried to save her. Now that she’s human again, he should be overjoyed. Trouble is, Lila’s been cursed to love him. And if Lila’s love is as phony as Cassel’s made-up memories, then he can’t believe anything she says or does. When Cassel’s oldest brother is murdered, the Feds recruit Cassel to help make sense of the only clue—crime-scene images of a woman in red gloves. But the mob is after Cassel too—they know how valuable he could be to them. Cassel is going to have to stay one step ahead of both sides just to survive. 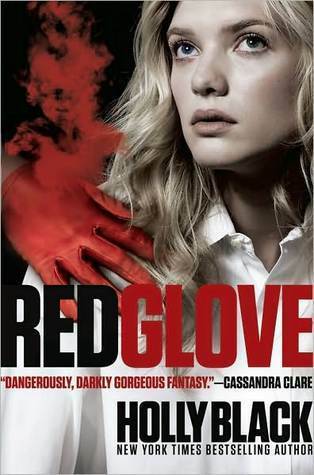 Red Glove picks up after Cassel finds out his whole life and memories have been a lie constructed by his crooked brothers and well-meaning mother. You’d think that finding out you’re the rarest form of Curse Workers would be wonderful, but unfortunately this just multiplies Cassel’s problems when both the mob and government want to get their hooks into him. When a family member is murdered, the Feds put big-time pressure on Cassel to join them and spy on Lila’s mob family. Lila isn’t dead but the barrier between them is bigger than ever. Cassel’s mother working Lila to believe she loves Cassel makes it impossible to act on his feelings for her. Her feelings are a lie and manufactured. Yet, he’s tempted because he’s been in love with Lila for so long. The romance was filled with such longing, and I found myself wanting Cassel to just give in, dang it! Her skin is soft and scorchingly hot after the cool night air. Her leg twines around mine. It feels so good, I have to choke back a gasp. It’s so easy. Wrong, but easy. Even more exciting and addictive than the first, I was captivated by Holly Black’s dark world of cons, mobsters, and murderers. Cassel Sharpe has the most deadly ability of all. With one touch, he can transform any object - including a person - into something else netirely. And that makes him a wanted man. The Feds are willing to forgive all his past crimes if he'll only leabe his con artist family behind and go straight. But why does going straight feel so crooked? Black Heart was my favorite of the series. 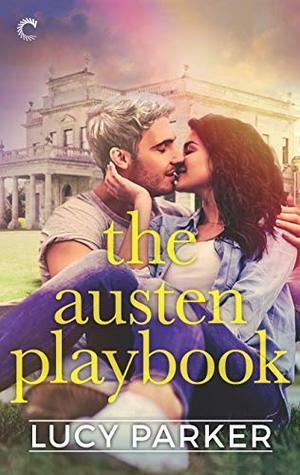 Everything is amped up: the pressure and danger of Cassel’s choices, the love and hate between Lila and him, and even Daneca and Sam’s relationship had drama. I was nervous and fascinated about how it all would work out. With Cassel’s choices narrowed, it looks like he’ll be forced into a life he doesn’t want, either from the control of the Feds or of a crime family. I desperately wanted him to figure a way around all of this or at least to work it out so that he had the upper hand. Of course Holly Black cleverly solved every problem, without making it too tidy to be believable. I also wanted his HEA with Lila! Cassel just needed to catch a break. I will say that for being a YA, Ms. Black manages to write some seriously passionate scenes! All that built up longing makes for a lusty and lovely payoff! If I have to die tomorrow when the Feds come for me, then this is the last request of my heart. This. The sight of lashes brushing her cheek as her eyes flutter closed. The pulse in her throat. Her breath in my mouth. This. From the main and secondary characters to the romance nothing is perfect, but everything is perfectly flawed. Holly Black exceeded my expectations, and I fell in love with this quirky and dark story. I loved this series so I’m giving away your choice of one book from the series: White Cat or Red Glove or Black Heart. Simply fill out the rafflecopter for a chance to win. The giveaway is INTERNATIONAL as long as The Book Depository ships to you. Click HERE for a list of countries. Ooh, the series seems to get better as the books go on! I could only read your first review--the concept is really cool, I think I may like it. I have heard really awesome things about Holly Black but unfortunately I haven't got a chance to read any of her books yet. I would probably pick the first one if I won. I'm so glad to see that the books improve as the series progress. :) Thanks for the review and giveaway! I've enjoyed reading other books by Holly Black, but (even though I've heard plenty of praise for them) I haven't gotten to these… Book one please! ^^ Thanks for the giveaway! LIke you, I liked the books more as they continued deeper into the stories. Very intriguing world Black created. However, half the time, I was thinking about how sweaty my hands would be in gloves all the time. Eew. Don't you just love it when the books get better and better? Sorry Rachel, I didn't read your reviews other than the first one even though I'm pretty sure you won't spoil anything:) However, I'm planning on reading this series someday so.. :D heh. Anyow, I'm pretty sure I'd hate his mom with passion since you clearly didn't like her at all either O.o and I love me some good romance! So glad you really came to love this series! I only read the first review, since I haven't starred the series. I did notice tour ratings got higher and higher. So excited to give these a try! I've heard so much about Holly Black's books. I haven't read anything by her though. This sounds like a series that really progressed as the books came out and that's definitely a sign of an authors talent. The characters and the romance sound wonderful. Fabulous reviews, Rachel. I haven't read these, so I only read the first review. I'm glad that you liked it well enough to keep going! Sounds like a fun series overall. LOVE that Jesse Eisenberg narrates the first audiobook. Love him. 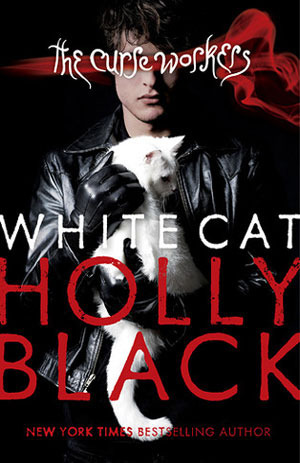 I have been wanting to read something by Holly Black for awhile and I even eyed this series. I like that it builds and builds and gets better! I love this series so much!! I would pick White Cat because that is my fave book of the series. Many thanks for the giveaway - this series sounds really interesting! I'd choose the first book, as I've not had the pleasure of reading any of them. I would choose "Red Glove." I was very lucky to manage to find a copy of the first book at a thrift store for $1.50. Oh, I haven't read this series but it looks like it got a lot better with each book! I love a progress like that! And it's a guy pov book! I recently read another guy pov book (Greed by Fisher Amelie) and LOVED IT! I do need to experience Holly Black books once and for all! Great review, Rachel! The White Cat so I can finally start the series! I need to start from the beginning - so WHITE CAT. 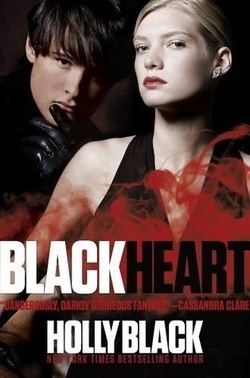 I think I would chose Black Heart as it has the best reviews. Although perhaps that first one so I can get in to the series from the start. Decisions, decisions! I love when the series gets better with every sequel and not the other way around. I haven't had a chance to read this series yet so I'd start with White Cat! I'd pick White Cat, because I have not read this series yet, but I'm really looking forward to :) Thank you!! Wow, look at those ratings, Rachel! It is AMAZING that you went from 3.5 stars to 4 stars to 5 stars on a series, I am so impressed. For some reason I have such a hard time connecting with this author's books, and I feel like such a bad, bad blogger because of this. 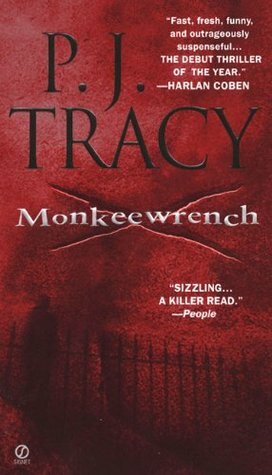 I read all her faery series, this first Curse Workers book, and her Coldtown book, too--I like them but I don't love them, and it feels really weird when I see how much everyone raves about them. Maybe I should have kept going with this series, hah. I'm SO glad you love them, though. I will just have to be the lone black sheep on this, too. Baaaaa! Oh I've heard wonderful things about this series (and about Black's writing in general). I plan on reading this series eventually. As to which book I'd like, I suppose I have to say the first. Nowhere better to start than at the beginning, right? I agree the books get better as it moves on. I would like to have BlackHeart if ever I win. Lovely first review Rachel! I'll read the other two after I read the series. I just want to be surprised. You immediately made me interested in this series with you enthusiasm. I would pick the first book as I have yet to read any of the books in the series!